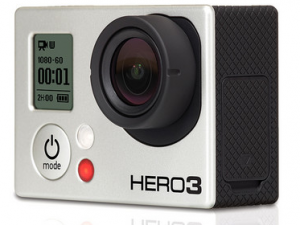 GoPro just unveiled the next generation of it's Hero line of cameras the GoPro Hero3. The Hero3 has a form factor that is 30 percent smaller (much better for mounting on bikes and helmets) and will be 25 percent lighter than its predecessor, with a resolution that is up to 4x higher, plus WiFi is included. At the top of the Hero3 Food Chain is the GoPro Hero3 Black Edition that is capable of capturing video at up to 4K res thanks to a processor GoPro says is 2x faster, they have also doubled frame rates at lower resolutions. That means 1080p60, 1440p48 and 720p120 modes are supported for your super slow and still-HD capture needs. Still photos can be captured at 12MP at up to a 30fps burst and in time-lapse intervals ranging from 0.5 to 60 seconds. The Hero3 Silver Edition maxes out at 11MP stills and 1080p30 video, while the White Edition drops down to 5MP stills. Out of the box, you get compatibility with the GoPro app for smartphones and the GoPro Wi-Fi remote. The Black Edition even comes with a Wi-Fi remote, nice touch. Quite honestly I was never really a fan of GoPro cameras. They seemed excessively bulky, had a clunky interface and lacked a lot of the features that the competitors had. The scale of the Hero3 is enticing and the feature set is equally compelling. The new LCD Touch BacPac should offer better UI and make set up smoother. I love the fact that it is there when you need it and can be removed to keep the size down. This looks like the model that will get me to switch over. Time to sign up for another track day so we can put this thing to use. Stay tuned for more info.